Want to learn how to dance partnered Charleston? Whether you’ve never danced before or are an experienced Lindy Hopper looking to expand your partnered Charleston steps, we have something for you! Join us for our 3 hour workshop. During the 3 hours Cengiz and Julia will introduce the basic step and a whole bunch of jazzy moves to add to your Charleston! No need to sign up with a partner as we will match you with someone to ensure an even number of dancers as well as frequently rotating. Learn to Dance in a Day! Peek into the basics of Lindy Hop in our 1-day crash course! Want to learn the Lindy Hop? Would you like to work-out, socialise and have fun at the same time? Join us for our Lindy Hop crash course. In 4 hours (with breaks) we will show you your left and right foot, teach you the basics of Lindy Hop and some fun moves which will get you dancing in no time. 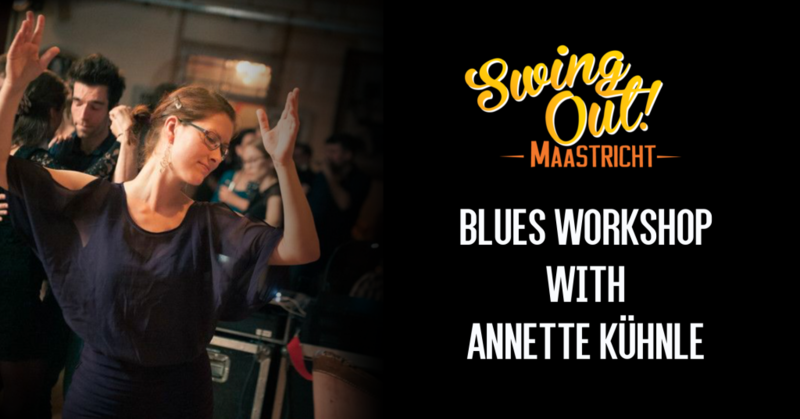 Annette hails from Heidelberg, Germany and is one of Europe’s most prominent proselytisers of blues dance as a teacher, social dancer, DJ and organiser. Her love of teaching and dancing are infectious and if you’ve travelled for blues, you probably already knew that! Annette is excited to be teaching in Maastricht for the first time and she is looking forward to helping you bring out your inner awesome! Her classes will introduce you to different styles of blues dancing and will be suitable for all levels – from complete blues beginners to dancers with experience curious to try out new styles. In this session, we’ll explore both the raw, highly rhythmical blues from the Mississippi Delta and the playful, fingerpicking blues from the Piedmont plateau area. Learn how to adapt your body and dancing technique to both and how to emulate the differences in the styles with ease. Get your hips movin’ and your feet groovin’ with this gritty blues routine that we’ll continuously spice up until it’s just relaxed improvisation. This class will provide ample opportunity for you to work on one of the most essential aspects of blues dancing: knowing how to move your own body to the music with style. In this session, we’ll visit the big cities of the blues: With New York in mind, we’ll learn how to move across the floor in relaxed close embrace and how to become the most expressive member of the orchestra. In Chicago, we’ll explore how to re-direct momentum between partners in a way that creates opportunities for individual expression. 19:30-00:30, Fanfarezaal Sint Servatius, St. Theresiaplein 18. Live blues guitar music by the amazing Duketown Slim with DJ-ed slow swing music. 9€ (regular)/7€ (student), free for workshop participants. We are excited to welcome Natalia Rueda to Maastricht for a one-day workshop! Together with Danae Lyginos, she will be using her extensive experience to teach classes that will show you how to build on what you know and take your dancing to the next level. There’s more than compression and stretch to Lindy Hop connection. Learn and explore the full range that makes for the best and most fun dances. Now that you have further developed your connection, discover a new world of partnership where followers contribute to the dance and leaders react in turn to make a truly conversational dance. 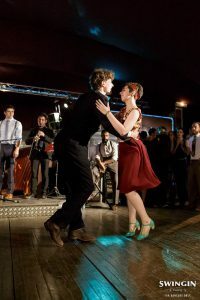 This is the class on the breakdown of Lindy Hop rhythms that will help you transition seamlessly from 6-count patterns to 8-count patterns and more. Putting it all together. This class will work on transition between patterns to help you smooth out your dancing and make it extra fun for you and your partner. Natalia began her career in the arts industry in Colombia, where she was born and raised. She holds 1st place titles in singing competitions, Cheerleading and Karate, a strong foundation on which she developed her athletic and vivacious dance and performance style. After moving to Canada, she discovered Swing dancing in 2005 and co-founded Swing Dynamite, the city’s first dedicated Swing school and performance troupe, in 2006. Natalia started dancing Lindy Hop at age 17 and at age 19, she had already led a Swing dance team to take a silver medal at the Canadian Swing Championships, one of the many places where she now teaches and judges competitions. As a performer, she has danced on many stages across Canada and the US. Highlights include dancing with the National Arts Centre Orchestra in Ottawa, at the Just For Laughs Festival in Montreal, at the Fallsview Casino in Niagara Falls, on TV with Rogers, ATV, CTV and Canada TV. She has also danced and acted in TV commercials. Natalia is a Lindy Hop, Jazz, Balboa, Blues and West Coast Swing champion. She is also a trilingual international Swing instructor who has been sharing her knowledge and passion for over a decade. Check out her website for a full list of awards and more videos. Greece born, Danae starting dancing Lindy Hop in 2011, with the Athens Swing Cats. It was love at first step and today she continues to find inspiration in the roots of the dance, the music, the history and the iconic figures of Lindy Hop. A few months after discovering Lindy Hop, Danae moved to London, UK, where she continued to take as many dance classes and attend as many social dances as she could. A few years after that, love took her to Nijmegen in The Netherlands where she immediately became a board member of the then newly formed dance school: Lindy What? Nijmegen. During her years in Nijmegen she was both a local organizer and teacher and she assisted Natalia in all her Lindy Hop classes during her 3 month teaching residency in the city last summer. Today, Danae lives and dances in Amsterdam where’s she has joined the organizing committee of Amstelhop Dance School. Her energetic dance style and happy smiling face makes her stand out in any crowded dance floor. 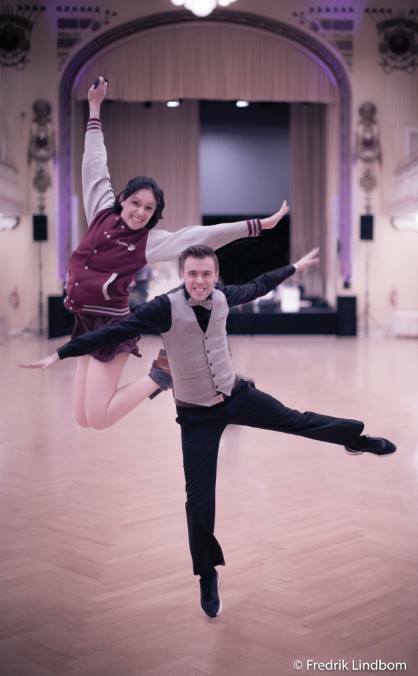 In collaboration with the PhD Academy, we are excited to announce that coming from Brussels we have two wonderful teachers, Alex & Jill, who will be teaching two levels of workshops for absolute beginners and intermediate dancers! Following the classes we’ll have an evening party with live music from the Jack Million Swing Cats! Level 1: This level is meant for absolute beginners. Whether you have no dance experience at all or some experience in another dance, this level is perfect for you! Level 2: This level requires some prior experience with 6 and 8-count footwork. Students who have previously taken our “Intro to Swing Part 1” course or an equivalent are all set. *Early bird prices end on November 15th! Jill started dancing when she was a child. She is now trained in classical ballet, modern jazz and jazz dance, contemporary dance, yoga and pilates. She has been occasionally teaching these different disciplines for the past years, sharing her time between her passion for dancing, her work as a contemporary dance producer, a massage therapist and a yoga instructor. She discovered Lindy hop while at University and since then has been teaching and attending numerous workshops around Europe. Jill has placed in a number of international Lindy hop competitions and is now teaching in Brussels and Belgium regularly. In Lindy hop her goal is to create a joyful yet challenging and encouraging experience for everyone allowing each dancer to develop his/her own individuality on the social dance floor. Alex has been dancing from a very early age. He started with breakdancing and other hip-hop dances. He has been teaching for the past ten years and took part in many competitions. Henceforth, his passion and his will to share continue with authentic jazz dances and Lindy Hop. Check out Alex and Jill in action below! Also hailing from Belgium, the Jack Million Swing Cats, a smaller version of the Jack Million Band, is an international band under direction of Jack Coenen. The band is specialized in the music of the Swing Era and is renowned as a world-class authentic interpretation of the repertoire of Glenn Miller. Its’ wide musical range includes the music of Frank Sinatra, the great Big Bands as well as up to date dancing and ballroom music. On December 9, 2017 Swing Out Maastricht and the PhD Academy Maastricht will be organizing a Lindy Hop party with live music from the Jack Million Swing Cats! The party will start at 20:30 at Dans- en Partycentrum Bernaards. There will be a quick taster lesson for absolute beginners at 20:45 and the Jack Million Swing Cats will begin playing at 21:30. There will be a door fee of 5€ (which includes one free drink). If you attend the workshop with Alex & Jill during the afternoon, entry to the party is free! Keep up to date with the party on our Facebook event. Traveling here from Köln, Swing Out Maastricht has the pleasure to announce our next teacher workshop on October 21st with Katrin & Jesus! The workshop will include some technique exercises, lead and follow concepts, an introduction to Lindy/Charleston figures and improvisation and finally some fancy Lindy moves that you can use at the social dance party. Following the workshop, we’ll have an evening social for anyone to join so you can try out your new moves! Level: Although the workshop classes will be for mixed levels, some prior experience with 6 and 8-count footwork is required for classes. Students who have previously taken or are currently in our “Intro to Swing Part 1” course are all set. Completely new to swing dancing? Save a spot on your calendar for another workshop on December 9th – more info coming soon! Katrin and Jesús discovered Lindy Hop a few years ago at a “Roaring Twenties” party. They were immediately amazed by the energy and joy of the dancers, and they decided they needed to learn some steps so they would be able to “survive” one or two songs at the next party … still unaware that swing dancing would become an important part of their lives. Since then they’ve dancing and teaching Lindy Hop in Cologne and visiting workshops all over the world. Swing Out Maastricht has the pleasure to announce our next teacher workshop on April 8th, 2017 with Becky & Jeroen! Heading down from Rotterdam we have Becky & Jeroen to teach us some useful techniques and to help you add more pizazz to your dance! 20:30-23:30 Social dancing with live music from the Mosam Dixie Dukes! Level: Although the workshop classes will be for mixed levels, some prior experience with 6 and 8-count footwork is required for classes during the day. Students who regularly attended our “Intro to Swing Part 1” course are all set. Completely new to swing dancing? Then come give it a try at the taster class at the beginning of the evening dance! No pre-registration is required for the taster class, so bring your friends! Saturday: Party with us to the Mosam Dixie Dukes at Ipanema! Monday: Get your big-band fix at the (free!) open practice of the Jack Million Band at Brasserie Tapijn. Technique & Tips: In this class we will work on making your dance flow like the Maas and improving your connection with your partner and the music. We’ll also add some extra grooves to your dance! Playtime & Rhythm: Bored of doing the same moves in every dance? Let’s get creative! We’ll provide a framework to spice up your social dancing: how to express yourself in each dance and be inspired by your partner. Hailing from Plymouth, UK, where she started dancing in 2005, Becky is a fast-footed swing addict! She has a love of rhythm which stems from her many years as a musician, playing drums in various bands for a decade, and this understanding of rhythm gives her a great bounce and understanding for the pulse of jazz music. Becky has been spreading her knowledge of dancing as one of the few full time Lindy teachers in the Netherlands over the past four years. Besides having strong class content, her classes are always an energizing experience and always leave her students ready to get on the social dance floor. Since he began dancing 4 years ago, Jeroen is rarely seen off the dance floor at parties and dances. He has been an obsessive Lindy Hopper and has immersed himself in the technical aspects of the dance, using his scientific background to understand the mechanics of Lindy Hop. The joy he finds in partner dance is evident from the enthusiasm and energy he emits on the dance floor, with his humorous and experimental style. He started teaching 3 years ago, and does so in both Rotterdam and Delft. His classes are simultaneously detailed and technical, but more importantly: filled with energy, joy and a lot of fun. He really enjoys seeing his students flourish and become as addicted to Lindy Hop as he is! We are excited to welcome Pasha and Yana back to Maastricht for another workshop! This time around they will give three partnered classes designed to show you how to make your dancing light and easy. Beginner level: Suitable for students who know a few basic steps (e.g., you joined our Intro to Swing Part 1 class). Beginner + Intermediate level: Mixed class for beginner and intermediate dancers. All classes will include different moves and routines that will help you create a relaxed and comfortable connection with your partner. 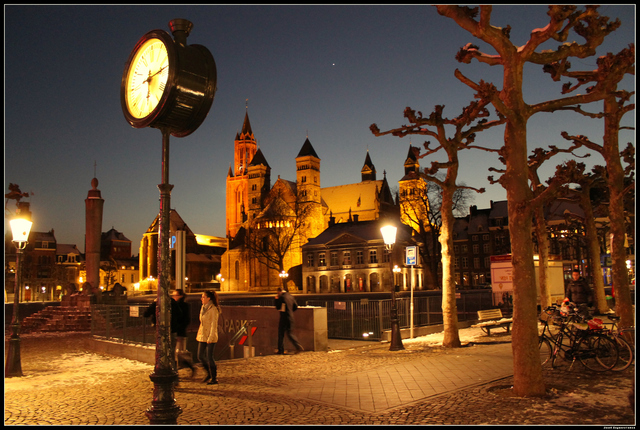 After class is done, come explore Maastricht with us! We’ll first stop off at one of the many delicious places to eat in the city center, and then the lovely Minouk will lead us on a tour of the city. If you’re interested in joining the tour, meet us at the clock in the Vrijthof at 16:00! In the evening, we are excited to join the inaugural party of Nothing but the Swing in Liege! If you have a car or are interested in a ride please note this in your registration and we’ll try and match people up. Entrance to the party will be free for all workshop participants! “I started dancing a little bit more than 2 years ago and after my first dance lesson I understood that I want to devote it all my free time: dancing every second, every day. I went to each party and each lesson. When I had a free hour, I spent it in the ballroom. After a year I won my first competitions, found Pasha and we started practicing together. As a teacher, I would like to stay close to the roots, pay attention to technique part, but not losing sincerity and lightness in dance. Herrang 2015 – solo – 1st place, lindy hop strictly 1st place. Flying over from London we have upcoming international teachers Katie Cobalt & Fred Lindbom. Playful and creative in style, these two will teach you how to improve your dance moves whilst having a blast! 20:45-00:00 Social with the Gumbo Jazzband starting at 21:00! Growing up in Sweden with a Bugg teacher for a mum, Fred was hooked on partner dancing at a young age! After almost 10 years of bugg dancing he hung up his dance shoes thinking he was done. After moving to London five years ago, he found Lindy Hop and started dancing all over again. He currently teaches Lindy Hop in London, competes in international competitions and also dances in the Skyliners troupe. After attempting various dance styles from Bollywood to street dance, Katie fell in love with the silly fun energy of Lindy Hop four years ago. Now currently living in London, she dances in two troupes, the Dixie Dinah’s and the Skyliners and has competed and won multiple awards internationally.